Can you imagine relaxing in a hot tub while floating on the ocean, surrounded by British Columbia's beautiful coastline? We will take you there aboard the Green Eva. 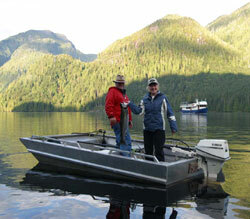 Soaring eagles, towering trees, bustling sea lion rookeries and fjord like inlets are just a few things you will see. Nature abounds here so keep your eyes open as you may also see whales, bear, native cultural areas and a variety of sea birds. With just 4 staterooms all our tours provide a good level of privacy, personal attention and comfort. This fifty foot steel-hulled vessel is equipped for your utmost comfort and safety. She has four double occupancy staterooms. The forward upper deck with comfortable seating provides wonderful sightseeing and photo opportunities, limited only by your own imagination. Check out the wheelhouse on the main deck or take in the sights as you relax in the spacious dining lounge after enjoying the fine dining that is a hallmark of our tours. We use nothing but the best of West Coast seafood, prepared with care and attention to detail. Of course, we will always cater to special diets. Finally, take your complimentary wine and relax in the upper deck hot tub. In the quiet of the night, you may even hear the wolves howl. This fifty foot steel-hulled vessel is equipped for your utmost comfort and safety. She has four double occupancy staterooms. The forward upper deck with comfortable seating provides wonderful sightseeing and photo opportunities, limited only by your own imagination. Check out the wheelhouse on the main deck or take in the sights as you relax in the spacious dining lounge. For the most part, fly fishing and spin casting remain virtually unexplored in our remote coastal regions. 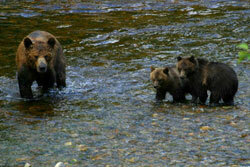 Salmon returns are reaching historical levels in these rivers and streams. With 35 years of commercial fishing experience, I have personally watched these runs rebuild over the past few years to extremely healthy levels. Fish won’t be the only thing you see as you journey into areas resplendent with beautiful scenery and wildlife such as whales, dolphins, seals, sea lions and a variety of seabirds. And, don’t forget the Grizzlies, black bears and eagles, who are there to feast on the salmon that will spawn and die in their natal stream. Keep your camera handy and loaded. fishing rod in one hand, camera in the other. After a hard day fishing, relax with a glass of wine in our upper deck hot tub, and compare stories of the days catch while possibly cruising to a new location.